It was a homecoming for Elena Delle Donne in Delaware tonight, as the USA kicked France, 84-62. Preparation time is precious for the US team. Team USA has a strong UConn flavor. Team members aren’t overly concerned about the Zika virus. Elena Delle Donne’s dog Wrigley is ready to cheer her on. EDD is featured in ESPN the body issue. Get to know queer Olympic hopeful Angel McCoughtry. 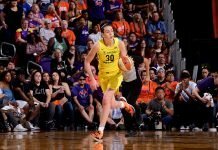 Sue Bird and Breanna Stewart find themselves in a uniquely similar place on the Olympic roster. Stewart is the best, one columnist says. The newly-relocated Dallas Wings hope to take flight with fans. An in-depth look at the 5-18 Stars. The Mercury are well-represented at the Olympics. The Washington Post recognizes the WNBA and the Olympics. Storm rookie Breanna Stewart says Black Lives Matter deserves the WNBA’s support. The late great Prince loved the Minnesota Lynx. Robin Selvig has retired as Montana’s coach after 38 years. Many props to him. Patrick Klein has been promoted to associate head coach at Ohio State. Valparaiso has added John Motherwell as an assistant coach. Robin Dolan is Hartford’s new assistant coach.